"The great White-Out of 95"
When in March 1995 David P. Soares and Uwe Römer met for the first time, they had a very special reason to risk their lives and drive through the total “White-Out” uphills the Cascade Mountains: Apistogramma! 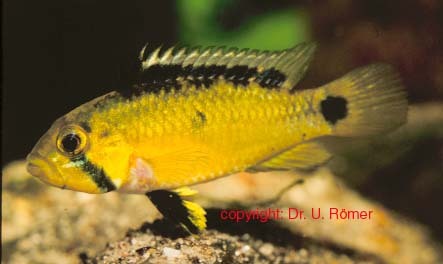 Uwe was working at his PhD about Apistogramma at that time and wanted to “collect” some - then new - Apistogramma cf. juruensis in Oregon at David´s house. David, the man from the mountains, was a skilled hobbyist especially interrested in maintaining and breeding the same group of Neotropical Dwarf Cichlids. The whole “expedtion” was a real big success, as this ended in their first intercontinental fish-exchange and a couple of follow-up publications in different countries. This was the start for a permanent and efficient contact: Numerous visits of Dave in Germany and Uwe in the US followed. Finally it lead the friends, meanwhile called the “Apistogramma-Idiots” by some of their friends, to found an American-German joint venture which they named Soft Water Dwarf Cichlids (SWDC). Soft Water Dwarf Cichlids is running two main businesses: a fish hatchery and a book store to bring both to interrested aquarists. The book store offers Cichlid Atlases 1 and 2 - the Natural History of Neotropical Dwarf Cichlids -, but also all available english language books of Mergus-Publishers, well known to most aquarists in the US and Canada as Baensch´s Books. The hatchery is especially designed to spawn Neotropical Dwarf Cichlids, that shall be mainly delivered to interested aquarists and other ”Apistogramma-Idiots” within the USA and Canada, but are shipped wordldwide meanwhile. Fishes from the hatchery placed in Oregon are regularely “updated” and contain some rare species and color forms of Apistogramma seldomly exported from the Neotropics and only exceptionally distributed in North America. The “Apistogramma-Idiots” hope to make all these wonderful little fish available and affordable for everyone who keeps an aquarium.